uskin's father was a very successful sherry merchant based in The City in London. The sherry, imported from Spain, was among the world's finest and many of England's richest developed a recurring taste. The reward was a goodly fortune which John James Ruskin used to comfort his family and do everything he possibly could to stimulate the genius he and his wife knew they had sired, the fellow John James Ruskin always proudly referred to in conversations and letters as "My Son." Not all the sherry lovers lived in London. As a result, John James often traveled to their humble homes outside the capital to offer his liquid wares. Arriving, he would be warmly welcomed, toured through the commodious house, and provided, in the early evening, with an elaborate dinner, after which, as all the assembled enjoyed their postprandial glass, or two, of the best Domecq Sherries (Pedro: John James' partner, owner of the vineyards that created the fine valuable stuff). When his Son was old enough, he was often invited to go with his father on these excursions, travelings which would stimulate the Son's loves of nature and the English countryside. At the same time, these visits to the homes of the rich (and sometimes famous), would serve as a silent teacher, offering uncensored insights into the workings of the British social class system, giving him first-hand insights into how his country's few haves lived which he could then easily compare with what he had seen of the lives of the millions of have nots who lived cheek-by-jowel near his family in London--well, not quite cheek-by-jowel! Perceptive thrice-over, it wasn't long before the Son began to grasp that the accumulated riches that afforded his father's clients the opportunity to build their Downton Abbeys--adorned by their elegant, impeccably maintained, gardens, castle-imitating turrets, marble staircases, with their Turner pictures on the wall--was cash never spent alleviating the plights of those millions of almost cheek-by-jowel poor. It was--even though the fruits of the lesson would not grow to maturity until two more decades had slid their way into history--the beginning of the radical sociological consciousness which, when it came to be expressed unambiguously in the Son's lectures and print, would, without palliation, regularly excoriate his father's overindulgent clients and those like them for their selfishness and abandonment of their obligation to ensure the well-fare of their society (his father had serious reservations about the wisdom of the excoriations). 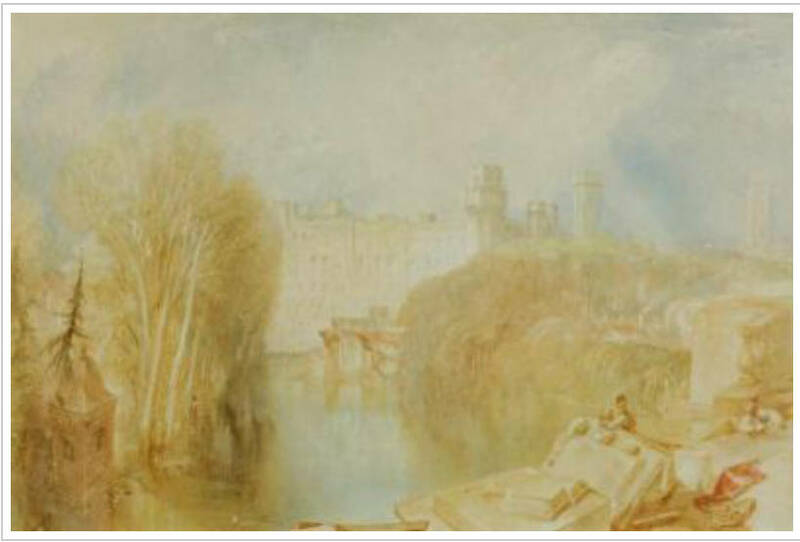 Joseph Mallord William Turner, Warwick Castle. Not, when you think of it, a bad thought for a ten-year old privileged Son of a prosperous sherry merchant to have had.